Red Pill – Blue Pill, Which would you choose? 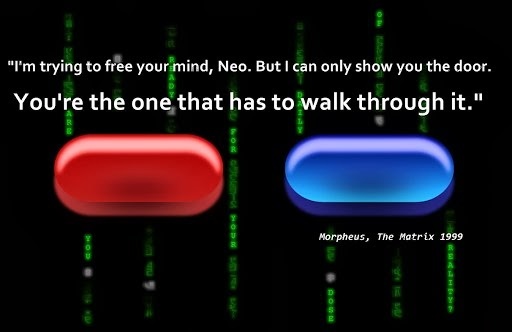 In the movie the Matrix, the blue pill represents blissful ignorance, while the red pill represents the sometimes painful truth of reality. The world of the blue pill is the world in which most of us live. We were all taught to go to school, get good grades. We were taught that if we did good in school and then went to college, we would land a good paying job. We were taught to put in our 8, 10, 12 hours per day. Work really hard for 30 to 40 years then we would get a gold watch and retire. We were taught that once we retire we would live off our pensions for the rest of our lives. We could travel, play golf or tennis, enjoy time with our friends and family. We were taught that if we follow the advice of the medical community we would have a longer life to be able to enjoy our new found retirement time. We were taught that if we had any type of depression or stress along the way all we needed to do was to take a pharmaceutical to get us through. Then as we got older we realized that the job wasn’t what we wanted to do, we just didn’t enjoy it or it didn’t afford us with the things we wanted out of life. We realized that the jobs weren’t for life, that someone else was making the decisions for us. We realized that those pharmaceuticals that helped us get by weren’t really helping in the long term and our health continued to deteriorate. Most people choose the blue pill oblivious to the fact that there is a better way. I want you to choose the red pill. Yes you will face a dose of painful reality in the beginning, but once you realize that there is a better way you will be glad you chose the red pill. I want to help you realize that yes getting that good education was important and you can use it to your advantage, but more importantly to help you realize how to take your own life and your own circumstances into your own hands to control your own destiny. I want to help you to the gain freedom from conforming to a 8, 10, or 12 hour work day. How to leverage your time and the time of others so you don’t have to wait 30 to 40 years to realize your dreams. I want to show you how to get more out of life so you don’t need those pharmaceuticals just to cope. I want to show you how you can live a long and prosperous life that you control instead of someone else in the matrix. A life not dependent on big corporations, big pharma, or big governments. If you are ready to find out more about the red pill.